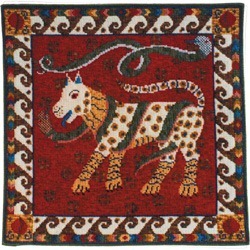 Inspired by a block-print from Central Asia, this shows a dog-like creature with large snakes entwined around it. The dog is sewn in gold, blue and cream and has randomly shaped spots all over him. The background has gold motifs floating over a mixture of reds. The kit uses Anchor tapestry wool on 10hpi canvas and measures 18" x 18" (45.7 x 45.7cm) suitable for a cushion.